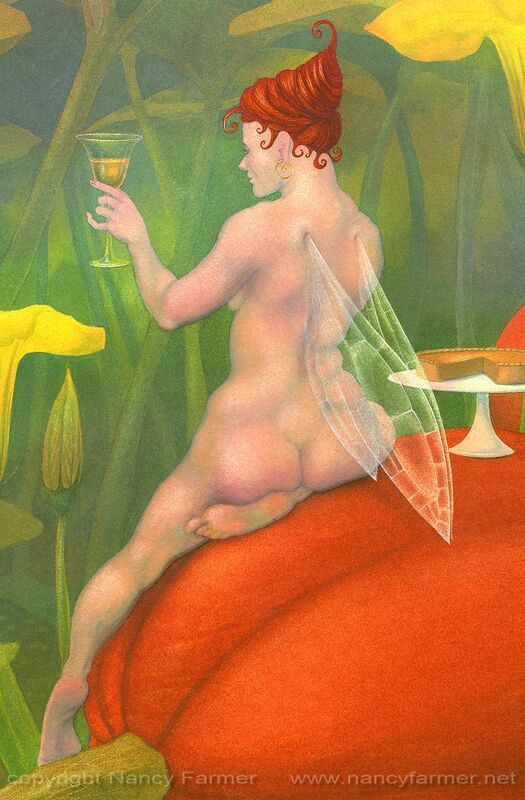 To refer to these voluptuous creatures as 'run to seed', seems unfeeling and unfair, until one considers that the whole point of flowers is to set fruit and thereby create seeds. It is their very raison d'être, the fulfilment of their purpose. Seed pods are often beautiful and fascinating, some glow with the deeply satisfied lustre of a summer well spent. Some bear scars of their months of travail, blemishes which, though upon a flower in the first flush of spring would be unsightly, on their ripened skin are the fascinating marks of a decadent maturity. The flower fairies (gone to seed) emerge into their second glory, heavy with experience, sweet and indulgent, but nobody's fool. 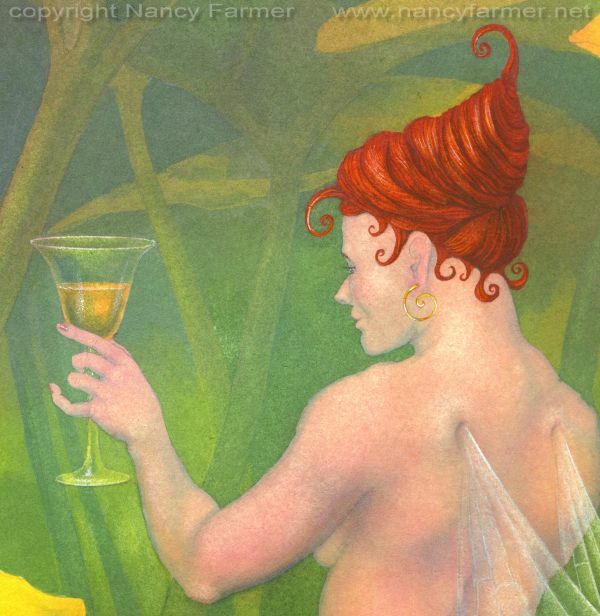 This painting was to be one of a series, but events (mostly Somerset Arts Weeks) over ran the project and to date I have only completed one more of these paintings: The Flower Fairies run to seed: Rose. I also have a sadly half-finished row of runner-bean fairies, which I hope to complete at some point. Pumpkin and Rose were both painted more-or-less from life... by which I mean that I painted the fruits from life, of course, as, come summer and autumn, there are quite a lot of pumpkins and rosehips in my garden. 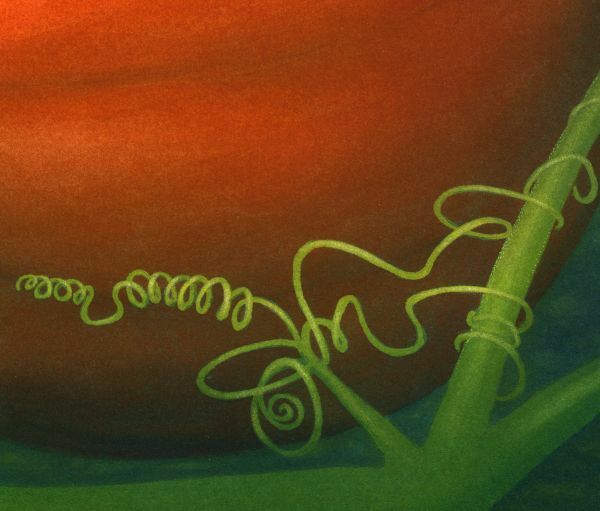 I can invent fairies, but it is very much harder to invent plants, if one wishes them to look like proper plants. 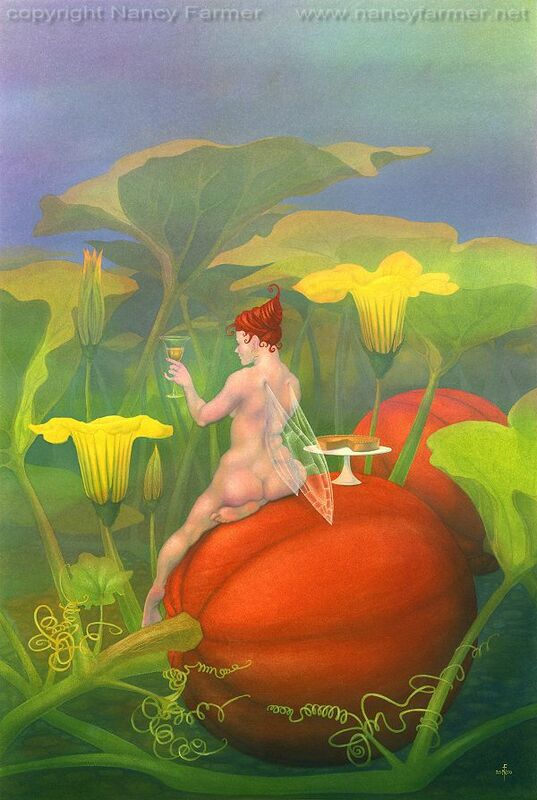 I suspect this fairy is drinking some form of pumkin wine - I'm sure it could be made - in which case I must say that she is something of a hardened drinking gal because, judging from the flowers on the pumpkins it cannot be later than about 9.30 in the morning!